Keep your nose to the ground and you might miss out on this delightful public art installation by Kurt Perschke! The RedBall Project travels to different urban locations with the purpose of encouraging the public to interact and re-imagine their cities. 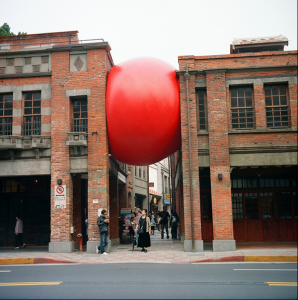 Waiting with anticipation for the RedBall Project to come to your hometown? Practice your slow looking skills by taking in the already marvelous sights gone unseen around you. Don’t forget to supplement your new discoveries with our double-take worthy featured artworks on our facebook page!